The changes resulting from future-oriented Industrie 4.0 projects demand new concepts for machine operation and monitoring. This also has an impact on the hardware, as the corresponding devices not only need to be adapted to the framework conditions, but must also fulfil the increased safety requirements. Which hardware enables users to operate their machines easily and to monitor them according to circumstances? The decisive factor here is whether the application is for the automotive industry, a wind turbine generator, a water treatment plant or an oil platform. Each of these areas of application is subjected to special ambient conditions, thus having its own particular demands on the devices installed. These need to be considered when selecting the required visualisation hardware. In the four typical applications listed above, the user would like to receive application data and information at any location. The values should not only be shown within the system, but also be viewable in the plant environment. To this end, a tablet PC can be used. In practice, however, it’s all too often the case that the tablet PC is not available when it is most needed. In contrast, a permanently installed HMI device enables the user to operate and monitor the application at any time. In a larger system, it is advisable to use both the tablet PC and the HMI device. There is a similar situation in a wind turbine generator system. A combined HMI hardware solution allows for the seamless monitoring and maintenance of the application. As is the case with the renewable energy production, extreme ambient conditions may also occur in a water treatment plant which can differ significantly from one location to the next. Temperatures, for example, may vary strongly. Humidity, seawater and aggressive gases will adversely affect devices used for operation and monitoring. Oil and gas, process industry and maritime applications are to be considered as a special case. In these fields of application, the hardware offered for visualisation purposes is restricted due to safety regulations and approvals. As a result, there are only a few manufacturers offering these devices. This is especially the case in the mobile sector. It is easy to see why visualisation for the scenarios described above cannot be based on only one platform. Various cross compilers are available, but there are some restrictions with regard to platforms. Furthermore, there are often problems on platforms that need a tailored solution. In this case, the web technology and, in particular, the HTML5 language, allows for cross-platform visualisation. HTML5, however, should not be viewed as a universal solution because there are always incompatibilities between the different browsers used on the different platforms. In general, the problems – often less significant visual problems – are easily rectified. Distinguishing features are needed to respond to the strongly growing competition. This may, for example, be an optimally designed user interface as the plant’s calling card. The portfolio around the open HTML5-based devices is complemented by HMI hardware for closed systems. This includes the ‘PC Worx Engineer’ engineering environment developed by Phoenix Contact for its PLCnext Technology control platform. Using the HTML5-based visualisation editor integrated in PC Worx Engineer, it is possible to create a closed and safe production chain. 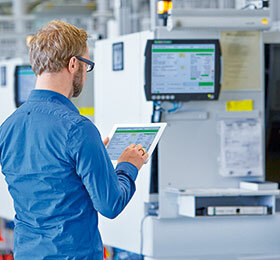 Phoenix Contact offers both HMI hardware for PLCnext Technology and open HTML5-based systems. With its comprehensive product portfolio, Phoenix Contact always offers the right hardware for the respective visualisation. Using a new processor generation, the devices are characterised by fast reaction and screen change times. Various touch technologies – such as analog resistive foil touch, projected capacitive glass touch (PCAP) and robust glass-film-glass-touch (GFG) – bring about advantages in all application areas. The front plate made of brushed aluminium impresses not only with its slim design but also with robustness and durability. HMI devices designed for an operating temperature from -32 to 70°C can be operated with work gloves. The IP67 protection class enables the use without control cabinet, directly in the application. The display is resistant to UV and IR radiation and can be read easily even in direct sunlight. HMIs which are used, for example, in production plants and the fields of process industry, machine building and building automation, perform important functions in indoor and outdoor applications. Further applications can be found in wastewater treatment and water treatment plants as well as in the fields of renewable energy production and automation of traffic tunnels and snowmaking systems. The HazLoc certification related to extreme conditions of use places virtually no limitations. Shock-proof, splash-proof and dimmable devices that are certified and approved according to GL, LR, BV, DNV, ABS, and EN 60945 are available especially to cope with the demands of shipping. All HMI devices can be configured individually with regard to application software, operating system, memory and design. Display sizes from 110 mm to 470 mm permit flexible system planning. Phoenix Contact provides not only device and connection technology, but also components for control cabinet and field installation as well as consulting and engineering services.